Newport County have earned their reputation as the 'giant-killers' of the FA Cup - and it's a fitting title for the League Two side. Tottenham Hotspur, Leicester City, Leeds United and now Middlesbrough have all felt the wrath of the mighty Amber Army over the past two campaigns as they miraculously, and deservedly, march on into the fifth round in style. But who are these minnows and how, for the second successive season, have they dumped out some of the top names in English football and progressed to the fifth round of the FA Cup - further than they ever have before? Last year, County fans were in dreamland. 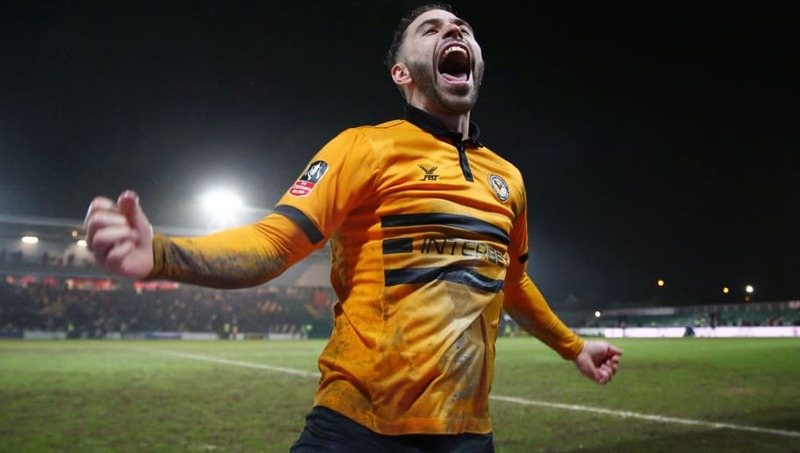 FA Cup victories over League One side Walsall and fellow League Two side Cambridge United set up a mouth-watering tie with ​Leeds United at Rodney Parade. With the scores level at 1-1, and with one minute remaining, Newport claimed a dramatic victory with a sensational towering header from Shawn McCoulsky to set up a lucrative fourth-round tie with Premier League giants ​Tottenham on home soil. Rodney Parade was rocking for this one. Temporary stands were built raising the capacity to over seven thousand and Mauricio Pochettino respected the Welsh side by fielding a strong side captained by talisman ​Harry Kane. Spurs were evidently rattled by a fervent performance from the hosts and the renowned riotous atmosphere at Rodney Parade - managing to escape defeat through Kane's goal at the 82nd minute. Newport County were off to Wembley. 7,200 fans made the trip along the M4 to the English capital, but unfortunately for the travelling support, the fairytale came to an end with a respectable 2-0 defeat. Now, following the phenomenal performance against ​Middlesbrough, and after booting former champions Leicester City out before that, County face a rewarding home tie with current Premier League title holders Manchester City. The prospect of a visit from the ​Premier League champions and Pep Guardiola is scarcely credible for a club that folded in 1989 and were within 90 seconds of dropping out of the Football League altogether in the final fixture of 2017. The supporter-owned club still holds the record for the oldest club record transfer, paying £80,000 for Alan Waddle from ​Swansea City back in 1980 but this could be all set to change following two years of financially rewarding cup runs. Newport, now unbeaten in their past five home FA Cup games against higher division opposition, won't be a walk-over for Guardiola's men. They should expect a hostile Rodney Parade, with its sodden mud-spattered and uneven surface, to be absolutely rumbustious in this fixture. County's incredulous supporters bellowed "​Manchester City, we're coming for you," following the comfortable victory over the Boro - and the Citizens should be wary of the Exiles' threat posed in all areas of the pitch - and the bawling from the stands. The club's success has been masterminded by highly-rated manager Michael Flynn, Newport born and bred, who played for the club in four separate spells between 1999 and 2017. The 38-year-old has assembled a decent squad for the division featuring some stand-out players who will inevitably go on to pastures new in the leagues above. Shot-stopper Joe Day, who raced off at the final whistle against Middlesbrough to attend the birth of his twin daughters, is highly regarded in League Two as one of the finest goalkeepers in the division. ✅ Keeps a clean sheet vs @Boro.  Sets up @EmiratesFACup 5th Round tie vs @ManCity.  Runs off the pitch at full time to check news on his pregnant wife.  Finds out she’s in labour expecting twins. Robbie Willmott, who was stacking shelves in a supermarket less than two years ago, has had a hand in six goals for Newport County in the FA Cup proper (four goals, two assists). The midfielder is quick, energetic and a fine passer of the ball. Striker Pádraig Amond has now scored against ​Leicester, Tottenham, Middlesbrough and will be looking to add Manchester City to the list. The prolific Irishman has scored 17 goals with five assists in all competitions this campaign for the Port. At the heart of Newport's defence sits Mickey Demetriou, an intelligent defender who plays at centre or left back, who has featured in all but one game of County's mixed season so far. The England C international will be marking the likes of ​Sergio Aguero or ​Gabriel Jesus in the fifth-round tie. Another player, who is not likely to start but always a fan-favourite in Newport is David Pipe. As tall as he is wide, the imposing and muscular Pipe is a man beloved by all at the south Wales club. Rarely seen with a shirt on, the 35-year-old Welshman with a solitary international appearance for Wales, is a fiery character that won't be bullied or threatened by any Premier League talent. So, write it in your diaries, take the evening off work, send the kids to bed early or tell your parents you're doing your homework and tune in on February 16 to watch the giant killers Newport County take on Guardiola's Manchester City side at the rugby ground Rodney Parade. It's going to be a cracker!